Design Time for ZNet Shows! 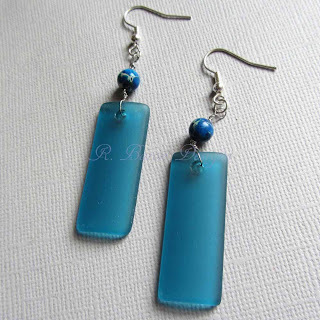 If you didn't see my recent post, I was selected by ZNet Shows to receive some free Cultured Sea Glass Beads in order to design some pieces for this new bead line. Isn't that any beader's dream? The generous selection of Sea Glass beads and pendants! Despite a crazy schedule, I was able to create four pieces; two earring pairs and 2 necklaces. I have another necklace design dancing in my head, but sadly, haven't been able to sit down and bring it to fruition, and the deadline is today. When I sat down to start my designs, I thought about the purpose of the creations...they are supposed to showcase the Sea Glass, so that other beaders can get ideas on how to utilize the beads. So I put my pride away and focused on making the Sea Glass the stars of the show. The first pair of earrings are simple, but I love them! Two rectangle pendants, with accenting blue rounds, wrapped and joined to silver ear wires. Next, I used two of the dagger shaped beads and black crystals for the second set of earings. 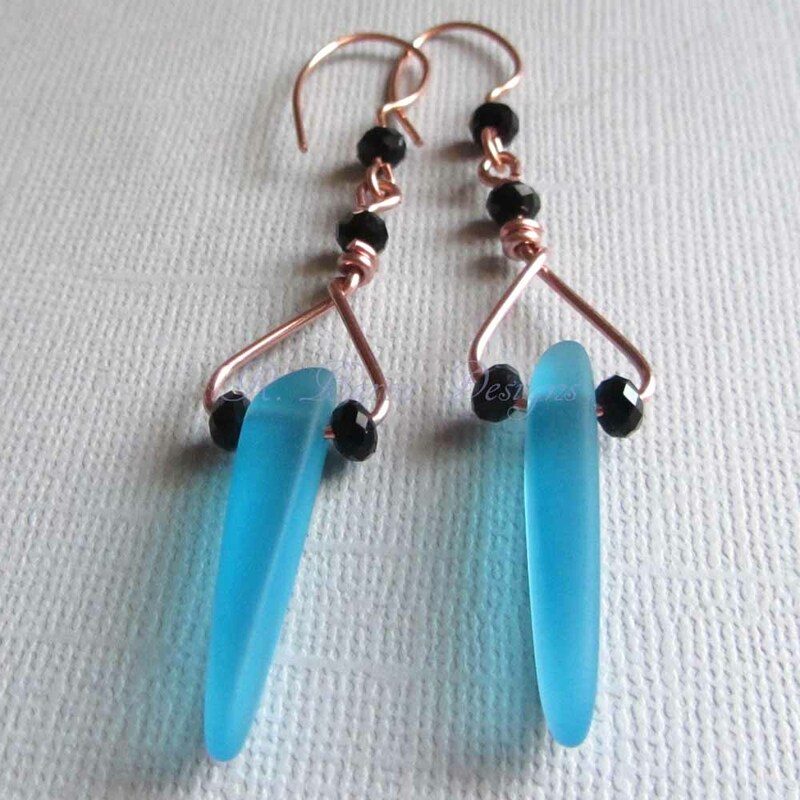 These were wire-wrapped on some rosy copper, and I made some simple coordinating ear wires to finish the earrings off. For the first necklace, I stacked two of the pendants to create one, more substantial pendant, which was wrapped onto a bail and added to some silver chain. 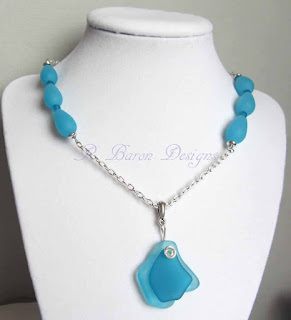 I accented the necklace with some more of the shaped sea glass, and made the necklace adjustable by using a lobster clasp and more chain. I would definitely wear this with a pretty sundress on a summer day! With the second necklace, I wanted to make use of some of the crystals that ZNet sent, just because I can't resist anything sparkly. I'm not much of a girly-girl, but sparkles are a favorite. 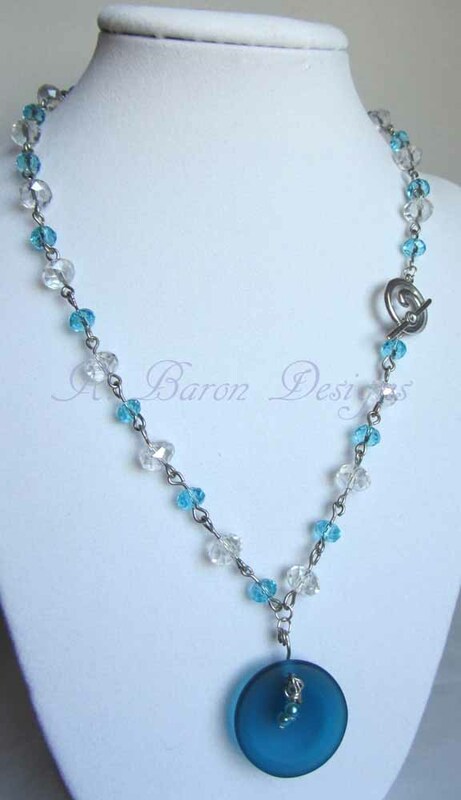 So I wrapped individual crystals and created a chain, with the toggle clasp off to the side. The pendant on this necklace is simple--again I wanted to showcase how easy it is to make something beautiful with these beads! I can't thank ZNet Shows enough for their generous offer and the opportunity to get to design with some of their beads. Please check out their ZNet Shows Facebook page or ZNet Shows' blog about the challenge to see some of the other beautiful creations by other artists! 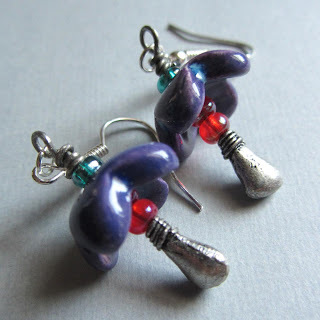 I am thrilled to take part in the Art Jewelry Elements Earring Challenge! I love doing various challenges and blog hops because they force me to find the time to be creative; it's too easy for me to put my muse in the back seat when life gets hectic--and that makes her very, very cranky! 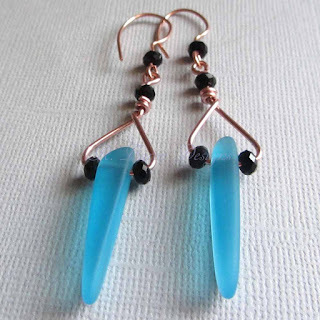 What is great about this challenge is that we have to use an art jewelry element in the earrings--this mean there has to be handmade components, minimizing the mass-produced as much as possible. As someone who also makes handmade lampwork, I am very passionate about using handmade components as much as possible! My first two pairs just happen to use clay components from the same artist: White Clover Kiln. I wanted to use two different artists' beads, but when my muse hollers, I listen. The first pair turned out so beautiful--it's nice to have a vision make it to reality! 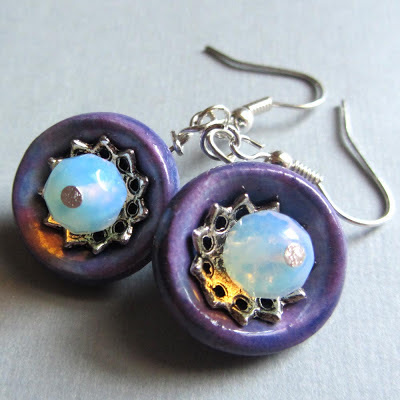 The camera can't catch the beautiful hues in the purple clay domes, which cradle pewter bead caps, and opalite rounds. 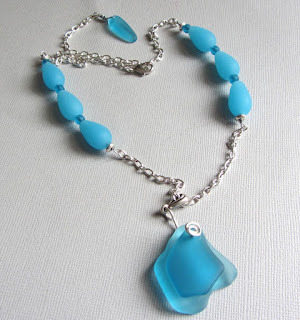 Opalite is one of my favorite "stones" even if it is manmade. I love the iridescent quality, and it pairs beautifully with the purple and silver tones. Next are a pair of dangling "flowers". The purple flowers are again from White Clover Kiln, and have a gorgeous underhue (is that a word?) of a periwinkle blue. I paired some seed beads with the clay flowers to give the illusion of real flowers, and used some funky head pins I found at one of my local bead stores. I love these, too--they will be hard to put up for sale! Be sure to visit Art Jewelry Elements today, so you can see all of the gorgeous creations other artists have put together. The talent is astounding and somewhat intimidating! But most of all, it is inspiring! Time to Design for ZNet Shows! My job has been especially draining lately, and I have been feeling very restless given that my creative muse has had to take a backseat to getting through the day without falling asleep in my soup...well, that's exaggerating a little bit. I haven't been eating much soup. So imagine my surprise and delight when I received an email from Bill, from ZNet Shows...a major bead supplier! I knew of ZNet from my most recent visit to BeadFest Philly in August. I stumbled, literally, into their area, at the point of bead exhaustion...I was ready to head back to my hotel and just crash. But the people manning the ZNet booth were so friendly that I reached deep down into my soul and found the strength to buy a few more beads and some lengths of cool chain. So what did Bill want? 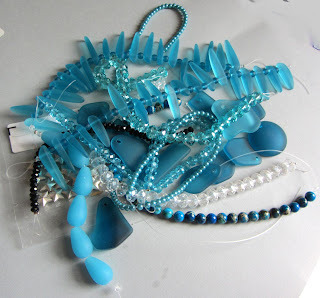 Based on my participation in the Bead Soup Blog Hop and my other blog posts, they wanted to offer to send me free beads if I was willing to design some pieces that they might choose to take to Tucson this year. If you are new to beading, Tucson is where all sorts of huge bead shows are held in February. So, he wanted to send me free beads? And I would get to create with them? Of course I am interested! And this is what I received!!! 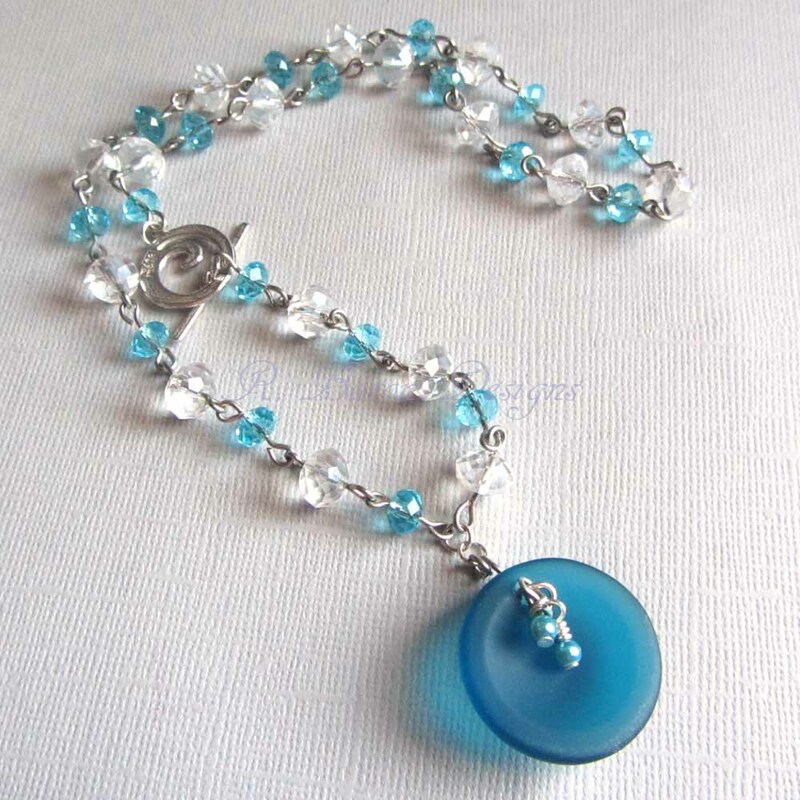 Bill had said that they were looking to focus on their "Sea Glass" line...so I was expecting a small handful of beads...not this extremely generous, gorgeous bead soup! So this weekend, I will be locking out the world and playing! Pieces have to be done by January 24th, so I am hoping to have everything done and photographed by Monday...I will be sure to share my creations once I get the go ahead from ZNet!